Neglect Nothing…Or so we thought! “Thorough preparation must lead to success. Neglect nothing” is one of the famous quotes from our school’s namesake, Sir Arthur Currie. One month ago, I would have embraced that quote and been quite confident that we, as a school team, had completed months of thorough preparation in anticipation of our school’s opening on September 5th 2017 ~ that we had neglected nothing. Furniture and equipment were purposefully and intentionally selected to allow for collaboration and teamwork in each learning environment. Resources and technology purchases reflected our idea of an innovative learning space where iPads and Chromebooks are as easy to access as pencils and pens. Incoming staff were prepped for the upcoming journey. Conversations about student centered learning tasks and reimagining assigning homework beyond the instructional day occurred in June. Paper planners were not forgotten on the order list, they were intentionally left off as we wanted to dive into electronic forms of communication between home and school. Timetables, class lists and supervision schedules were prepared and distributed. The idea of starting from scratch, building community and creating a school culture different from any other were the foundation of months of planning, the lens through which I did my summer reading and the focus of many of my Tweets to my PLN. But it wasn’t until our opening day and the subsequent few days that followed that together we learned that our success was going to look different than first anticipated ~ regardless of the months of thorough preparation. Delays in furniture deliveries, ongoing construction projects, missing resource orders, partial pieces of this and that and an unprecedented additional 125 students created the conditions for our team to bond quickly and to be prepared to rethink our plans. Within days, we needed to find a way to get 42 seating options and table tops into a grade 5 room. Teachers who had planned to teach combined classes were now teaching different classes as we welcomed 5 new classes. Staffroom furniture became classroom furniture and folding tables doubled as meeting tables. Subsequent days brought interviewing for 6 positions, continued management of daily deliveries; not to mention the regular start of the school year busyness. Then the reality hit ~ although we had prepared ourselves for the lack of Learning Commons/Gym, the odd missed order and sharing our space with our construction crew, nothing could have prepared us for increasing our school population by 40% and the additional commitment that that increase was going to need on behalf of the whole team. Yet through it all, the Currie Crew has flourished ~ active learning happening in classes, numeracy assessments, Terry Fox Run, soccer games, planting trees in our community and even a school wide event wherein we all painted a memory piece for future generations are just a few of the amazing first month accomplishments. The success of these activities seems that much sweeter, knowing the challenges that were occurring in the background. 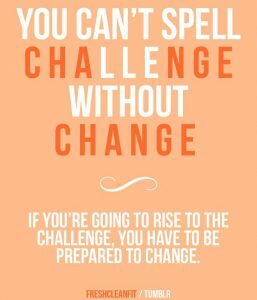 And although we still see the benefits of Sir Arthur’s quote, I’m wondering if a more appropriate quote for us might be: You can’t spell challenge without change. If you’re going to rise to the challenge, you need to be prepared for change. What has the first month of this school year brought you? Any unanticipated changes that have led to deeper successes?